Warmwater Knots - How to tie the best. The Duncan Loop (Uni-Knot) and occassionally the Non-Slip Mono Knot are about the only knots I use to attach my flies to the leader. In still water, or moving water for that matter, your fly needs all the help it can get to look as lively as possible. The Duncan Loop allows the fly to move because the fly is not tied tight to the leader's tippit as it would be with a Clinch or similar knot. The Duncan Loop can be configured in three ways. 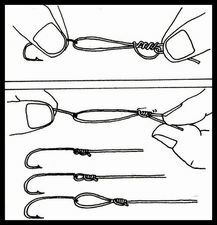 A small open loop for maximum fly action, a larger loop for shock absorbtion when a fish strikes, and as tight knot against the hook's eye like a Clinch Knot. Here are the steps in making a Duncan Loop and how the loop can be adjusted to fit the situation at hand. The Non-Slip Mono Loop is the other open loop knot that I frequently use. It has one advantage over the Duncan Loop. It won't tighten against the hook when you're fighting a heavy fish. Sometimes the Duncan Loop can be tough to open up after a fish does it's business. 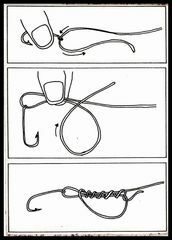 The illustration shows you how to tie the Non-Slip Mono Loop. 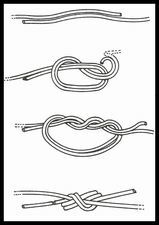 The Double Surgeon's Knot is the only knot I use to attach the tippet to the leader. It's an easy knot to tie. Just make sure to wet the knot with siliva (spit) before you tighthen the knot. 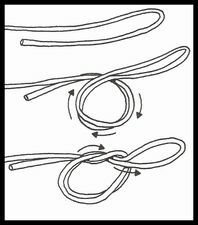 Use the Surgeon's Loop for loop-to-loop connections -- leader to the line and tippet to the leader. 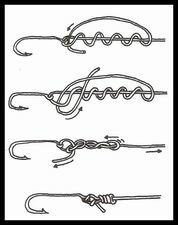 The Improved Clinch Knot is one of the most common knots known to fly fisherman. Many use it as their only knot to attach a fly to the leader. The only time I use ia Clinch Knot is to attach a dropper fly. Here is my dropper fly set-up. First, the top fly is attached to the leader with a Duncan Loop. Next, the dropper fly is attached to a piece of tippet material with a Duncan Loop. Finally, the piece of tippet material with the dropper fly is attached to the hook's bend of the top fly with a Clinch Knot. As my friend Bill Hugel of the Piney Woods Flyfishers in East Texas points out, the Wotton Knot is a knot that is gaining in popularity as a substitute for the Improved Clinch Knot. It's an easy knot to tie and it seems to have good knot strength. I have been using it off and on for about two years.